"A 2007 U.S. EPA study found lower total costs for 11 of 12 green infrastructure projects when compared to equivalent grey infrastructure projects. The EPA study found the reliance on natural conveyance systems significantly reduced structural costs throughout the stormwater management chain. The opportunity to incorporate green infrastructure into other structures and landscaping also reduces the overall footprint of stormwater management infrastructure." -Jeffrey Odefey et al., Banking On Green: A Look at How Green Infrastructure Can Save Municipalities Money and Provide Economic Benefits Community-wide (American Rivers, Water Environment Federation, American Society of Landscape Architects, and ECONorthwest, 2012), 10. Conventional stormwater management infrastructure has been engineered to move the largest volume of water from a site as quickly as possible, collecting surface runoff in subsurface structures.2 Sustainable stormwater management captures water closer to the source, reducing combined sewer overflows (CSOs), ponding, and roadway flooding. In the process, rain water issued as an asset to improve urban ecology, microclimates, air quality, and the aesthetic quality of the public realm. Vegetated strips and swales filter and reduce sediment and filter pollutants through settling, physical filtration in the soil matrix, biological breakdown by microbes, and nutrient uptake by plants. 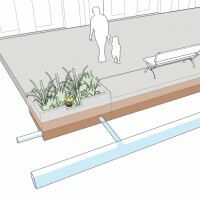 Overall stormwater runoff volumes may be reduced by designing facilities that absorb and infiltrate rain water in place. Water-tolerant plant root systems maintain the porosity of the soil while taking up excess water in the stormwater facility. “Low Impact Development (LID),” U.S. Environmental Protection Agency, accessed June 3, 2013. 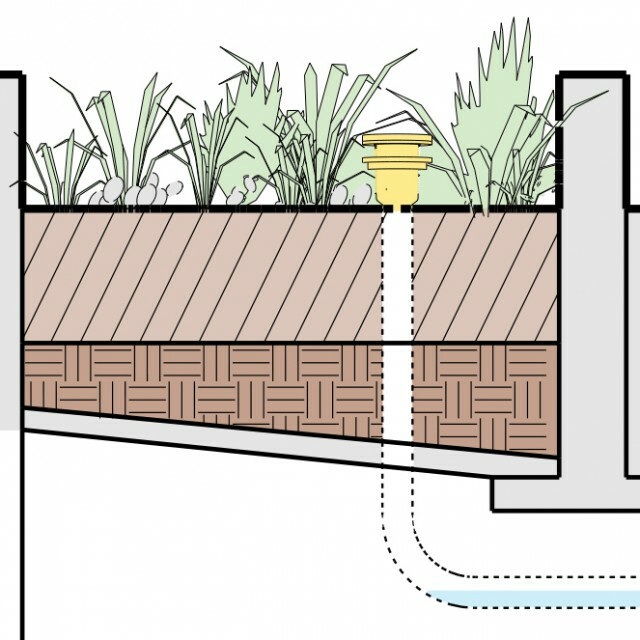 Noah Garrison and Karen Hobbs, Rooftops to Rivers II: Green strategies for controlling stormwater and combined sewer overflows (Washington, D.C.: National Resources Defense Council, 2011). “Managing Urban Runoff,” U.S. Environmental Protection Agency, accessed June 3, 2013. “Chapter 3: Fundamentals of Stormwater Management,” New Hampshire Stormwater Manual (Concord: New Hampshire Department of Environmental Services, 2006). “Deconstructing Green Infrastructure,” Erosion Control, accessed June 3, 2013. “Why Green Infrastructure,” U.S. Environmental Protection Agency, accessed June 3, 2013. Jeffrey Odefey et al., Banking On Green: A Look at How Green Infrastructure Can Save Municipalities Money and Provide Economic Benefits Community-wide (American Rivers, Water Environment Federation, American Society of Landscape Architects, and ECONorthwest, 2012). Green City, Clean Waters: Green Infrastructure Maintenance Manual Development Process Plan (Philadelphia: Philadelphia Water Department, 2012). Evaluation of Urban Soils: Suitability for Green Infrastructure or Urban Agriculture, (Washington, D.C.: U.S. Environmental Protection Agency, 2011). Garrison, Noah, and Karen Hobbs. “Rooftops to Rivers II: Green Strategies for Controlling Stormwater and Combined Sewer Overflows.” Natural Resources Defense Council, 2011. Kaspersen, Janice. “Deconstructing Green Infrastructure.” Erosion Control Magazine: 2012. New Hampshire Department of Environmental Services. “Chapter 3: Fundamentals of Stormwater Management.” New Hampshire Stormwater Manual. Concord: 2006. Odefey, Jefferey, Stacey Detwiler, Katie Rousseau, Amy Trice, Roxanne Blackwell, Kevin O’Hara, Mark Buckley et al. “Banking on Green: A Look at How Green Infrastructure Can Save Municipalities Money and Provide Economic Benefits Community-wide.” American Rivers, American Society of Landscape Architects, ECONorthwest, Water Environment Federation, 2012. Philadelphia Water Department. Green City, Clean Waters: Green Infrastructure Maintenance Manual Development Process Plan. Philadelphia: 2012. U.S. Environmental Protection Agency. Evaluation of Urban Soils: Sustainability for Green Infrastructure or Urban Agriculture. 2011. U.S. Environmental Protection Agency. “Low Impact Development (LID).” Accessed June 3, 2013. U.S. Environmental Protection Agency. “Managing Urban Runoff.” Accessed June 3, 2013. U.S. Environmental Protection Agency. “Why Green Infrastructure.” Accessed June 3, 2013. References for Stormwater Management: 29 found. Bean, Eban Zachary. "A Field Study to Evaluate Permeable Pavement Surface Infiltration Rates, Runoff Quantity, Runoff Quality, and Exfiltrate Quality." Department of Biological and Agricultural Engineering, North Carolina State University, Raleigh, NC. Odefey, Jefferey, Stacey Detwiler, Katie Rousseau, Amy Trice, Roxanne Blackwell, Kevin O’Hara, Mark Buckley et al. "Banking on Green: A Look at How Green Infrastructure Can Save Municipalities Money and Provide Economic Benefits Community-wide." American Rivers, Water Environment Federation, American Society of Landscape Architects, & ECONorthwest, Portland, OR. Jurries, Dennis. "Biofilters (Bioswales, Vegetative Buffers, & Constructed Wetlands) for Storm Water Discharge Pollution Removal." Department of Environmental Quality, State of Oregon, Salem, OR. California Stormwater Quality Association. "California Stormwater BMP Handbook: New Development and Redevelopment." California Stormwater Quality Association, California Stormwater Quality Association, Menlo Park, CA. Kaspersen, Janice. "Deconstructing Green Infrastructure." Erosion Control Magazine, Forester Communications, Inc., Santa Barbara, CA. US EPA. "Evaluation of Urban Soils: Sustainability for Green Infrastructure or Urban Agriculture." EPA Publication No. 905R1103, US Environmental Protection Agency, Washington, DC. US EPA. "Field Evaluation of Permeable Pavements for Stormwater Management: Olympia, Washington." Office of Water, US Environmental Protection Agency, Washington, DC. Philadelphia Water Department. "Green City, Clean Waters: Green Infrastructure Maintenance Manual Development Process Plan." Philadelphia Water Department, Department of Environmental Protection, Commonwealth of Pennsylvania, Philadelphia, PA.
City of Melbourne. "Landscape Treatment Policy for Nature Strips and Medians in Streets, Avenues, and Boulevards." City of Melbourne, City of Melbourne, Melbourne. Charles River Watershed Association. 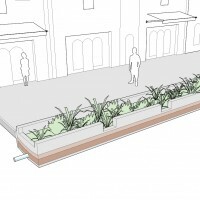 "Low Impact Best Management Practice (BMP) Information Sheet: Stormwater Planter." Charles River Watershed Association, Charles River Watershed Association, Boston, MA. Faha, Lori, Mike Faha, & Brett Milligan. "Low Impact Development Approaches Handbook." Clean Water Services, Clean Water Services, Hillsboro, OR. USKH Inc. Water Resources Group. 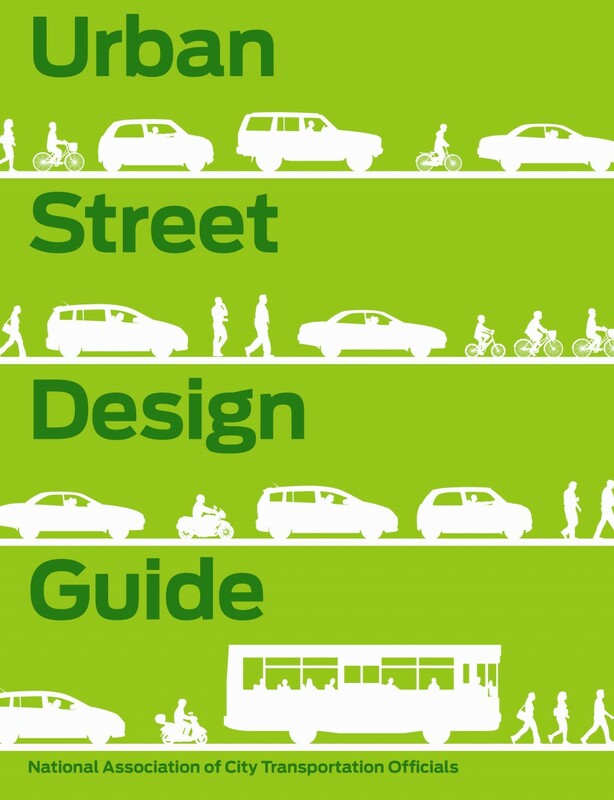 "Low Impact Development Design Guidance Manual." Watershed Management Services, Municipality of Anchorage, Anchorage, AK. Hudson County Planning Division. "Low Impact Development/Green Infrastructure/Best Management Practices for Sustainable Stormwater Management." Hudson County Planning Board, Hudson County, Jersey City, NJ. McCarthy, Jillian. "Chapter 3: Fundamentals of Stormwater Management." New Hampshire Stormwater Manual, Volume 1: Stormwater and Antidegradation, New Hampshire Department of Environmental Services, Concord, NH. Blick, Sandra A, Fred Kelly, & Joseph J Skupien. "Chapter 9.7: Standard for Pervious Paving Systems." New Jersey Stormwater Best Management Practices Manual, New Jersey Department of Environmental Protection, Newark, NJ. Wanielista, Marty, & Manoj Chopra. "Performance Assessment of Portland Cement Pervious Pavement." Stormwater Management Academy, University of Central Florida, Orlando, FL. Seattle Department of Transportation. "Permeable Pavement in the Right-of-way." Department of Transportation, City of Seattle, Seattle, WA. Environmental Services, City of Portland. "Pervious Pavement." Environmental Services, City of Portland, Portland, OR. Huffman, Dan. "Pervious Pavement: An Infiltration BMP-A LID Technique." National Ready Mixed Concrete Association, Environmental Protection Agency, Portland, OR. Chopra, Manoj, Erik Stuart, Mike Hardin, Ikenna Uju, and Marty Wanielista. "Pervious Pavements-Installation, Operations and Strength, Part 1: Pervious Concrete Systems." Stormwater Management Academy, University of Central Florida, Florida Department of Transportation, Tallahassee, FL. Rottle, Nancy, & Vanessa Lee. "Re-Imagining Seattle Streets: Planting Strips and Street Edge Treatments for Urban Green Infrastructure." Green Futures Research and Design Lab, Department of Landscape Architecture, University of Washington, Seattle, WA. Garrison, Noah, & Karen Hobbs. "Rooftops to Rivers II: Green Strategies for Controlling Stormwater and Combined Sewer Overflows." Natural Resources Defense Council, New York, NY. Matsuno, Hiroko & Selina Chiu. "Street Edge Alternative Program." 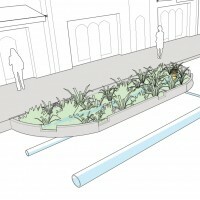 Seattle Public Utilities, The Stormwater Management Challenge, Seattle, WA. Hoffman, Greg, Stack, Rebecca, & Van Wye, Brian. "Stormwater Management Guidebook." Center for Watershed Protection, District Department of Transportation, Washington, DC. Richards, Lynn, Clark Wilson, Jenny Molloy, MaryJo Bragan, & Andrea Zimmer. "Stormwater Management Handbook: Implementing Green Infrastructure in Northern Kentucky Communities ." Smart Growth Program, Office of Policy, Economics and Innovation, US Environmental Protection Agency, Washington, DC. James, W & H von Langsdorff. "The Use of Permeable Concrete Block Pavement in Controlling Environmental Stressors in Urban Areas." Proceedings of the 7th International Conference on Concrete Block Paving, Conference Planners, Sun City. Ebihara, Tatsuji, C Bryan Young, Vibhuti Tiwari, & Lisa M Agee. "Treatment of Contaminated Roadway Runoff using Vegetated Filter Strips." University of Kansas, Kansas Department of Transportation, Topeka, KS. Hunt, William F & Kelly A Collins. 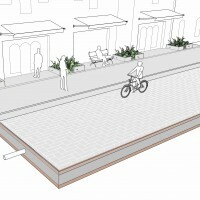 "Urban Waterways: Permeable Pavement: Research Update and Design Implications." Department of Biological and Agricultural Engineering, North Carolina State University, North Carolina State University & A&T State University Cooperative Extension, Raleigh, NC.